Size: 6.8" x 3.2" x 0.50"
Combines the features of the MathMate with the 2-line display of the TI-15. have math themes. Great for individualized practice of basic facts. Enter expressions with a missing number or missing operand using the "? Key". Also evaluate inequalities to build number sense skills. by 2's, 5's and more! 10ths, 100ths are in a specified number. From a technical point of view the TI-10 is a typical far-east design. The single-chip calculator circuit is bonded directly to a high-quality printed circuit board (PCB) while the keyboard makes use of a much simpler PCB. There is no relation ship to the TI-10 Profit Guide introduced already in 1986. Stokes Publishing Company, Inc. based in Sunnyvale, California sold a companion for the teacher, view the wonderful TI-10 Overhead Calculator. 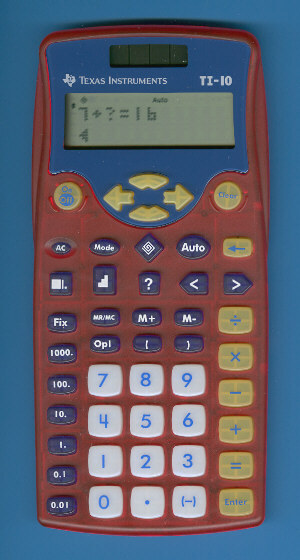 Math Explorer ™ and MathMate ™ are trademarks of Texas Instruments.